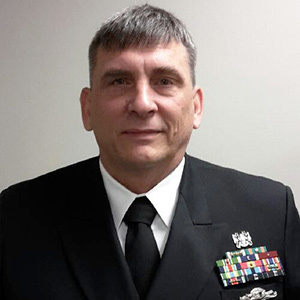 Now in his 26th year of duty in the Navy, John Harris plans to retire in October 2019. With a level of preparedness inherent to military personnel, he already earned a master’s degree in his new chosen field. “My father retired from the FDA after 30 years, and he had suggested I might want to work in regulatory affairs because of all the clinical experience I had gained as a military provider,” said Harris. A conversation with a coworker on potential college programs led him to San Diego State University’s Advanced Certificate in Regulatory Affairs. Fully online, the advanced certificate features four courses, all of which are transferable to SDSU’s master’s degree program. Harris completed the certificate in one year, then took another year and a half to earn his master’s. The class of 2018 graduate answered some questions about his career and his experience in SDSU’s program. I went to Pierce Jr. College in the San Fernando Valley, then I joined the Navy in 1992. I graduated from the Naval School of Health Science and became a hospital corpsman (HM). After HM school, I attended Naval Diving and Salvage Training Center (NDSTC) in Panama City, Florida and graduated as a diving medical technician (DMT). After seven years of working for different commands as a DMT, I attended the Naval School of Health Science, graduating as a deep-sea diving independent duty corpsman (DMT/IDC). I completed a bachelor’s degree in clinical health science from George Washington University, and now of course my master’s degree in Regulatory Science from San Diego State University. I have been in the Navy for over 26 years and would stay longer if needed. What do you think are the biggest strengths of SDSU’s Regulatory Affairs program? The program provided insight and a firm understanding of the processes involved in the development, testing, manufacturing, and distribution of pharmaceutical, biological and medical devices. The key strength is that RA professionals who work in the industry teach all the courses. They share their experiences with the students, provide the most current and technical information, and they’re very professional and passionate about what they’re teaching. Dr. Bodie [associate director/graduate advisor] was very involved with all the regulatory affairs students and was instrumental in keeping us on track and focused on graduating. She was awesome! Was the online component a critical feature for you? The online aspect was extremely critical. I work a full-time job, I have children to raise, a home that needs continuous care, four dogs, and my wife works long hours in her private practice. Due to the nature of my career and home life, my time is precious to me. The online component lets me work the program around my life versus my life around the program. I don’t believe I would have been able to attend school if the classes were not available online. How much interaction did you have with fellow students? You interact with the other students every week; sometimes more than others. You get to know your classmates even though they’re sometimes across the country. The first time I met many of my classmates was at SDSU right before the commencement ceremony. I did a literature review of the Medical Device Single Audit Program (MDSAP). As international manufacturing, production and regulatory standards improved, medical device companies started expanding across the global markets. But each country had their statutory requirements for the production and marketing of medical devices, making it complicated to expand into new markets. To reduce the burden of different regulatory practices, countries decided to work together and developed the MDSAP, harmonizing the medical device regulatory requirements under one program. What’s the process of applying for military education benefits? You first need to go online and figure out what benefits you want to use. Then you go to the VA Education and Training website and apply online or go to your local VA office and apply in person. Next, you need to meet with a VA certifying official; schools usually have people available to aid veterans through the process. I used the Joan and Art Barron Veterans Center at SDSU. All the representatives were very helpful and walked me through the different issues I needed help understanding, and guided me through the VA paperwork. The Joan and Art Barron Veterans Center was quintessential to my success in completing my master’s program. For more information about the curriculum and how to apply, go to regsci.sdsu.edu or call (619) 594-0845.